I’m not big on beauty. If you’ve known (or followed) me for a while, you’ll know that I typically steer clear of make-up. But the one thing I absolutely can get on board with are big, full, loaded lashes! “The bigger the better” is my eyelash ethos. As a natural blonde, without mascara, my white lashes give me pin-holes for eyes – and unless you’re Tilda Swinton, this is not a good look. Which is why I was SO excited to be treated to a set of extensions from the amazing lash and brow expert at Pastels Salon, Laila Nazari (see more of her work on Instagram > here <). We started by tinting my upper and lower lashes to a blue/black colour, so they matched the extensions (brunettes need not apply). We then began the hour-long process to glue the lashes on. One of the questions I’ve been asked the most is “did it hurt?”. The answer? Not even a little bit! A few girls told me they fall asleep on the bed because the whole experience is so relaxing – this actually happened. In fact, next time I think I’ll bring my Ipod and a pair of slippers! Laila used a medical adhesive and three different sizes of lash extensions, which result in a 30% increase in size (any longer and you’ll just look like stepped out an episode of TOWIE – nooooo thank you). 30% looks long, lovely and natural. I’ve waited quite a few weeks to post this, because one of my biggest apprehensions were girls saying that the extensions pull out all your lashes when they start falling out. True? Nope! (Well, at least not for me) Much to my delight, my lashes started to (very gently and sporadicly) fall out after about two weeks. My conclusion? LOVE! I haven’t so much as reached for my mascara in over two weeks now. If fact, I love them so much, my sister and I are booking two more appointments before Christmas! Consultations with Laila are free, just call Pastels Salon Jumeirah – +9714 388 3534 to book in. 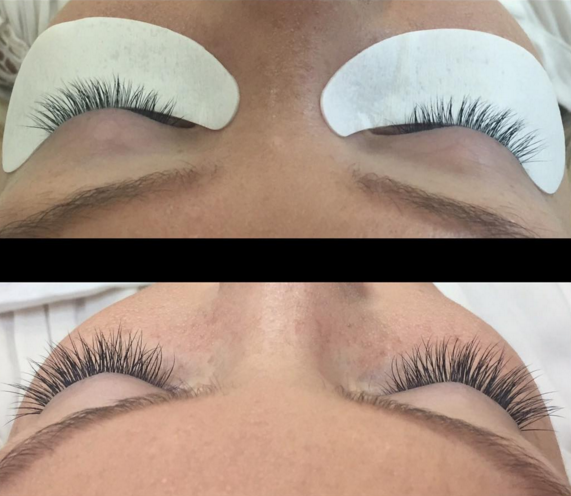 Please note: all new eyelash extension and LVL clients must book a consultation prior to booking an appointment with Laila.